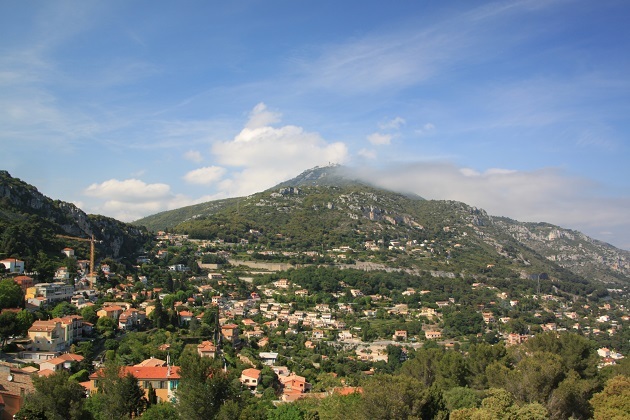 After Eze we got back on the Moyenne Corniche and followed the road all the way to Menton on the Italian border. It looked like a pretty little place but we opted not to stop again quite so soon and sought out signs for the Grande Corniche. Not so easy to find. After a false start we turned around but found the right road in the end. 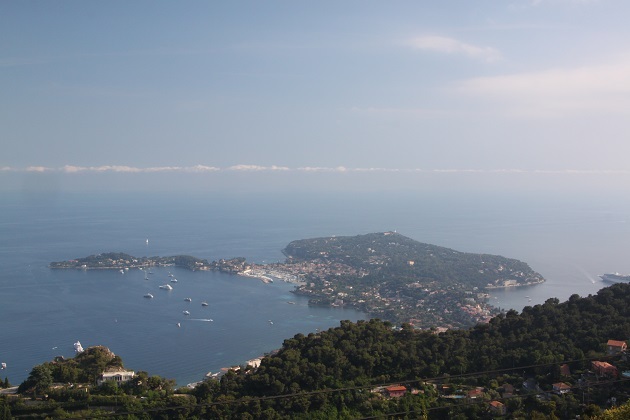 The Grande Corniche is the highest of those three incredible coast roads. 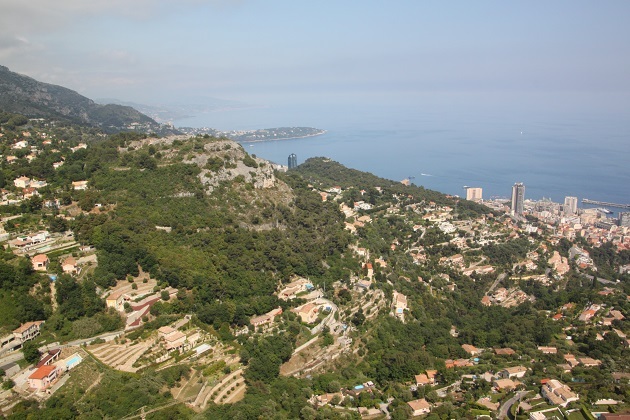 It is 19 miles long and rises to a height of 1,475 feet as it passes above Monaco. We had to stop here and check out those views. 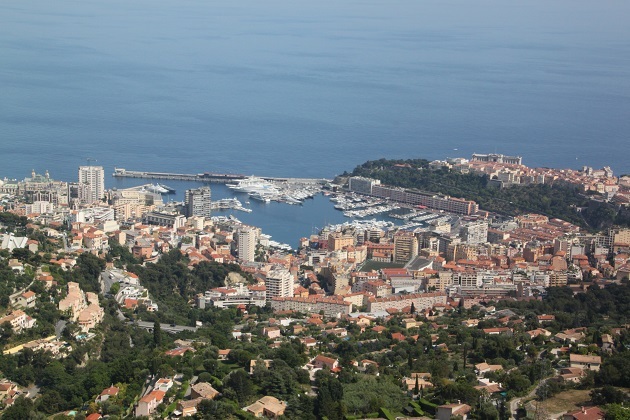 Monte Carlo from above looks just amazing, really at its best I think when viewed from on high. 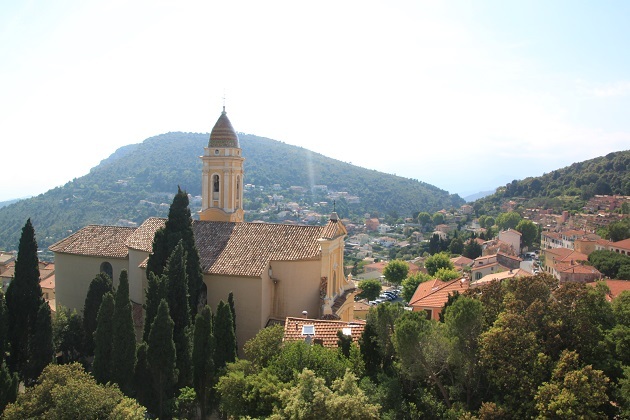 We were excited to get a bird’s eye view of all those mansions too dotted around the hillside. The road has some interesting history. 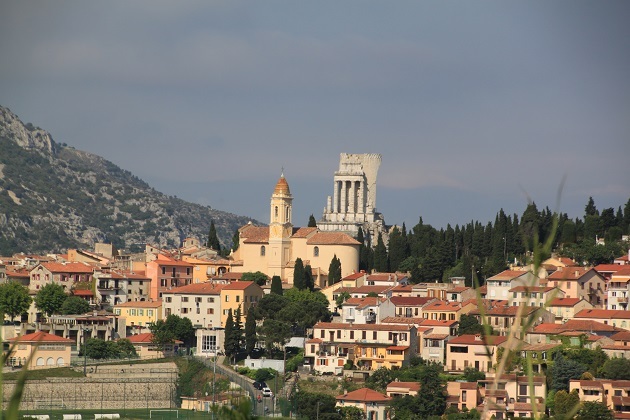 It was built at the beginning of the 19th century to facilitate the movement of Napoleon’s troops to Italy. So much quieter and less busy than the Moyenne Corniche and you don’t pass through many places at all. That doesn’t matter one bit, the road is the real star of the show here. Sensational and far reaching views the whole way along, we just loved it. 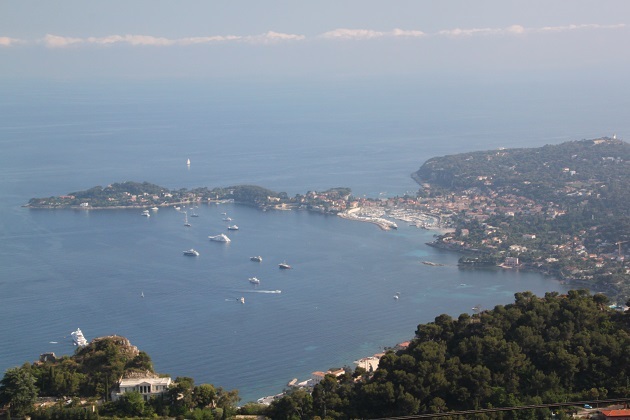 One one side is the stunning Mediterranean coast, on the other we saw rustic villas, pines and cacti. Apparently Alfred Hitchcock filmed parts of the movie “To Catch A Thief” here and lots of car companies use it for their adverts. 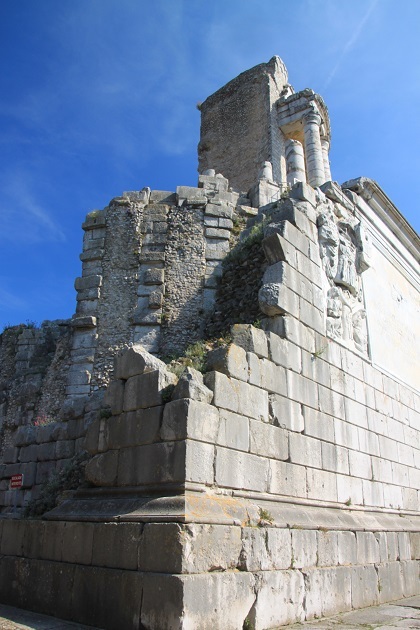 One of our highlights and main stops was La Turbie, the symbolic border between Gaul and Ancient Rome. 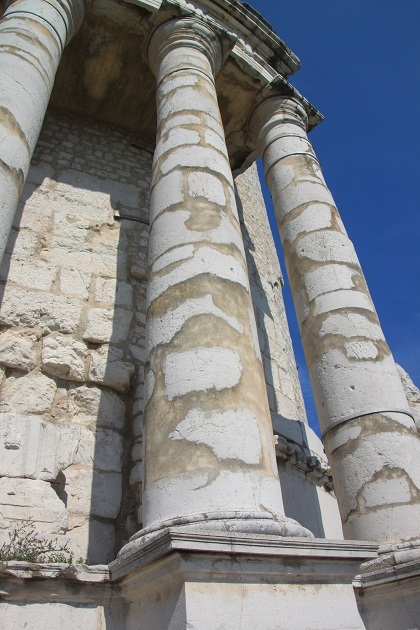 We parked up, checked out the views (you really never cease to be amazed by them) and then debated whether we had time to visit the Roman colonnade – Trophee des Alpes. In the end we reasoned we couldn’t not go inside. So glad we did this and the entrance fee of 5 Euro each was well worth it. 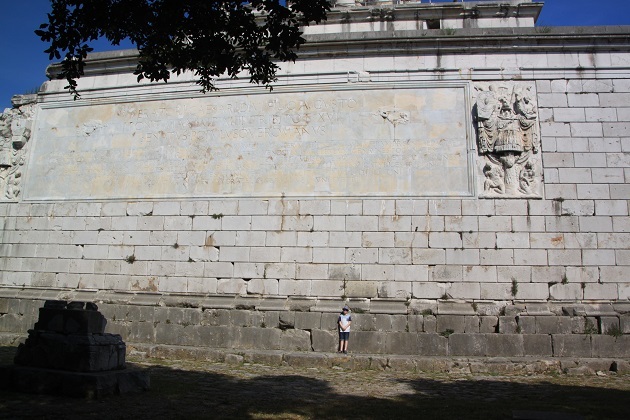 The Romans repressed the natives here and built this massive monument to prove their dominance. 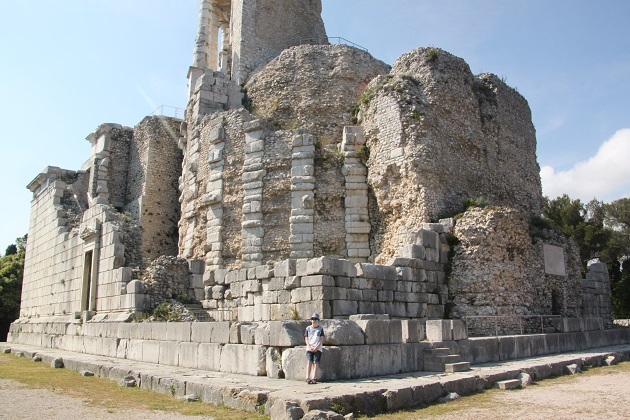 It was destroyed when the Roman Empire fell and the stones were used to build houses in the area. One hundred years ago a restoration project began and that’s what you see today. I saw it described somewhere as an “immaculate ruin.” That is spot on. We were the only people there so had the whole place to ourselves. 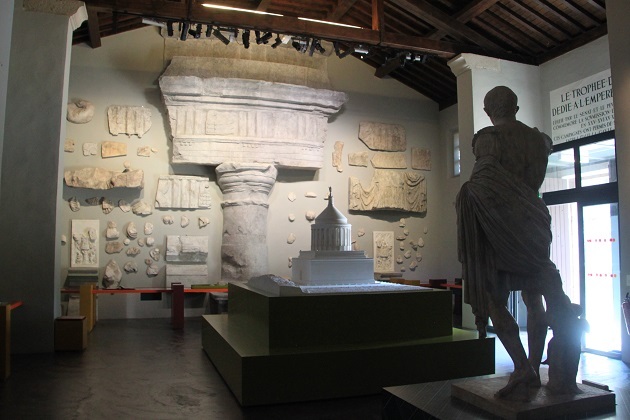 First we looked in the little museum which had some great information about the history of the place. 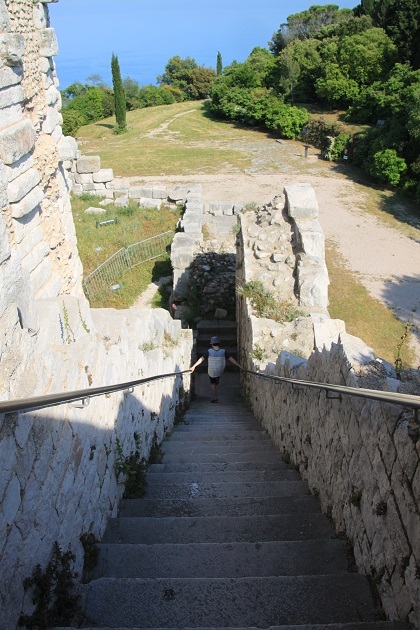 Then a guide took us to the top of the structure. 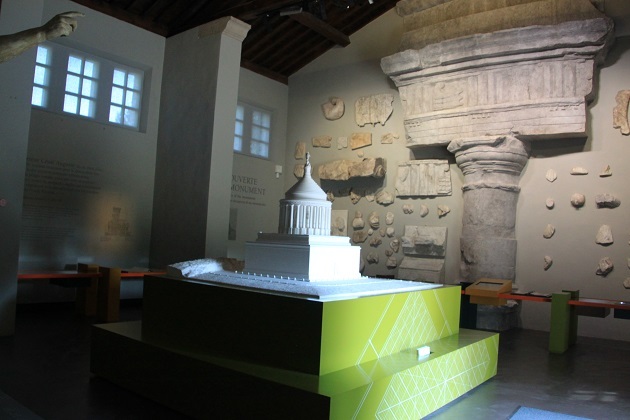 The rebuilt monument is 35 metres high but the original was estimated to be 50 metres tall with a statue of the Emperor on top. Apparently this area is known for its frequent fog. We did see a lot of mist from the Moyenne Corniche earlier in the day, but late in the afternoon it had cleared and the views were unparalleled. Back on the Corniche, a quick look back to that colonnade and then it was back to Nice. Terrible Friday evening traffic on the motorway put paid to our plans for a quick stop in Antibes but it didn’t matter. Driving those two coast roads had been incredible and a memorable and perfect way to spend our last day on the stunning Cote d’Azur. 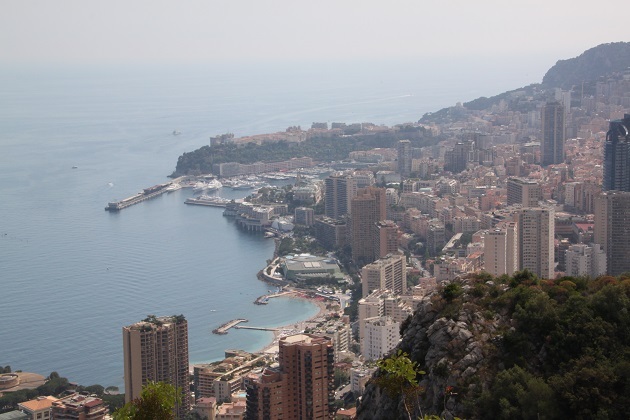 Some stunning photos of Monaco from the Corniche. I’ve enjoyed reading your posts on the Côte D’Azur, thank you. 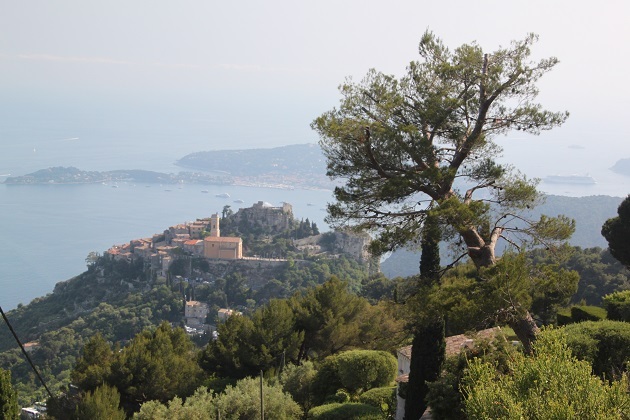 I loved those views of Monaco from this road – it seemed more impressive and incredible looking down from high up. 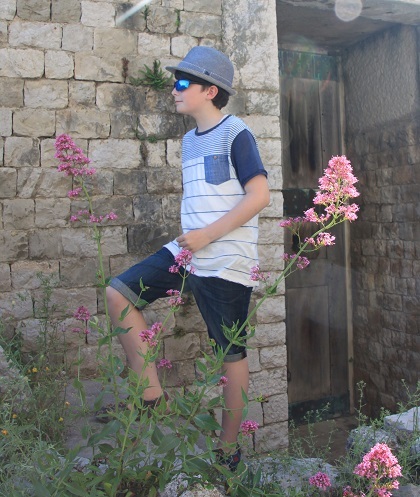 We had a great time on this holiday, looking back at those blue skies and sunshine now makes it seem like another world! Looks like a stunning drive and some wonderful views. I liked this post! It is a fantastic drive Andrew, there weren’t even any moans from the back seat of “how much longer” or “are we nearly there yet.” Proof indeed it is a drive worth doing! Back seat complaints or lack of them are always a good measure Joy! Those views look incredible. Well worth the drive. Absolutely Laura all that plus no moaning (or puking) from the back seat meant an all round success. Joy, I could look at those views for hours! Your day sounds so perfect…thanks for sharing it with us! It really was such a wonderful day Pam, one to remember! The whole road is just one amazing view Suzanne, only problem is so many photos to look through!! Awesome post and pictures! I felt like I was there with you. Thank you, it’s such a spectacular drive, glad you “came along”!! This looks like a totally amazing trip! 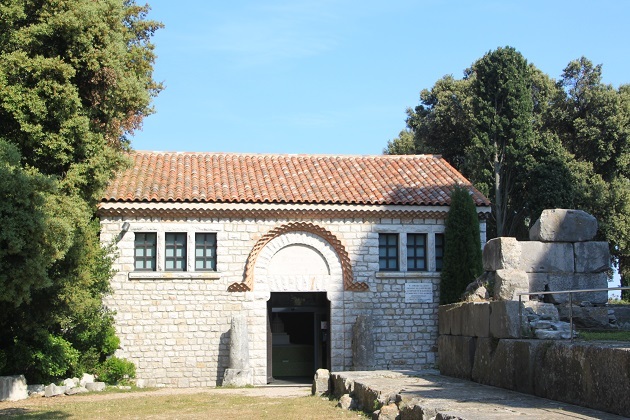 Stunning coastline, a wonderfully historic road and then those Roman ruins – just incredible and we definitely found something for everyone. Picture perfect scenery isn’t it – just amazing. 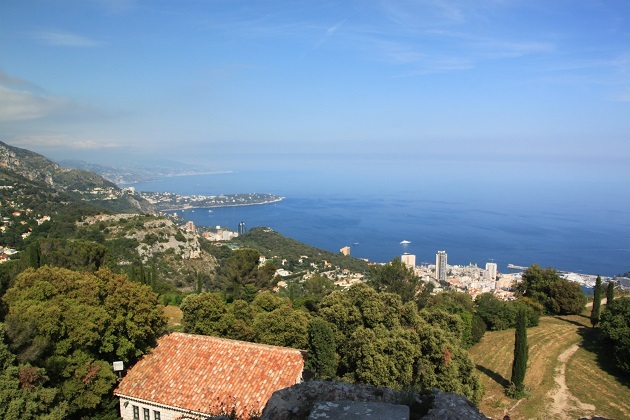 The views and Monaco in particular are just stunning, also it’s not really a very long way so great for fidgety kids in the back! It’s such a spectacular coastline, something to see round every corner. I was so impressed with it from up there George, spread out with all those tall buildings crammed together, somehow you appreciate it so much more. Wow! Just amazing – what a great holiday you had. It really was a great time Anabel, we managed to fit loads in and everyone was happy! Amazing photos and excellent information. Thanks. Thank you – it’s an amazing road with the most incredible views the whole way. We really did have such a great holiday Rosemary and this drive was the perfect ending to it. Sorting through the immense number of photos was actually quite good fun, great to look back on now as it seems like an eternity ago! 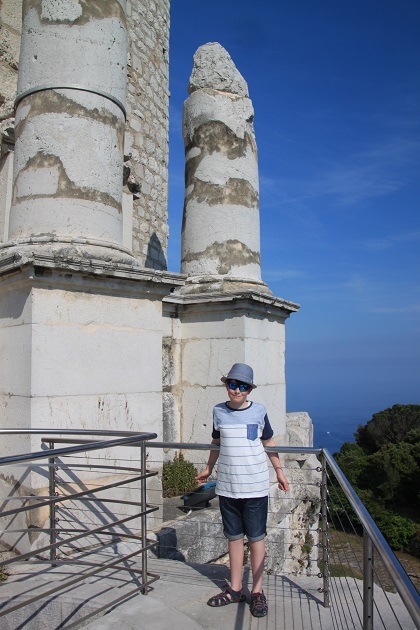 I know it’s lovely to sort through the photos later on Joy – holidays seem so far off when you get caught up again in the hustle and bustle of daily life! Blogging is also a great way to recall where you went as holidays can quickly become a distant memory! I’m not a great one for diarising as I go along – just take loads of photos and pick up a tonne of travel guides and info! Enjoyed your photos. We have a friend who is a chef and has a well known restaurant in La Turbie. Oh that must come in handy Karen – I bet the food is out of this world!! He was a Michelin starred chef in Paris and left it all behind to open his little hotel and restaurant. The food is wonderful.